Canadian Friends Service Committee, the peace and social justice agency of Quakers in Canada, was thrilled to be, together with our sister agency the American Friends Service Committee, supported by Lynn Salvo in her recent cross-Canada bike ride. 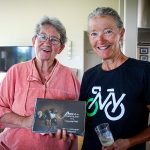 Lynn, 68, became the oldest woman to bike across the country when she completed the 6,616 km ride on August 26. Penni Burrell, Annapolis Valley Monthly Meeting, wrote the following blog post about her experience meeting Lynn at the end of her long journey. I was delighted to participate in two events related to Lynn Salvo’s bicycle ride for peace across Canada. She set the Guinness Record for Oldest Woman to ride the 6,000 plus kilometers across Canada, with CFSC and AFSC to benefit. The first event was a talk at “Thinkers Lodge” in Pugwash Nova Scotia. It was a fitting site. Thinker’s Lodge is where an annual meeting of esteemed scientists and philosophers from across the world gathered over a number of decades to consider how to create peace. This was as a result of WWII and the nuclear holocaust that ended it. The “Pugwash Movement” received the Nobel Peace Prize as a result: the actual medal is prominently displayed. As well as Quakers from the Halifax and Annapolis Valley Meetings, about 20 participants asked questions about how we can help bring peace into the world. We shared ideas that spanned individual, community, and political engagement. Lynn was also asked questions about how she was able to deal with the challenges of such a demanding journey. Her approach was to ‘let the land lead me’ and appreciate the support of her long standing friend who followed her in a car, with her baggage, allowing her to ride without constraint. Lynn also referred frequently to her gratitude for the strong and helpful support Matt Legge offered her throughout her trip on CFSC’s behalf. The second event was three days later when we cheered Lynn’s setting the record by swimming in the Atlantic Ocean, holding her bike up in victory. She’d left Tofino in June, starting at the Pacific with the same gesture. Her mother, children and other supporters including members from a bicycle club from Halifax, were also present to witness the record setting finale. 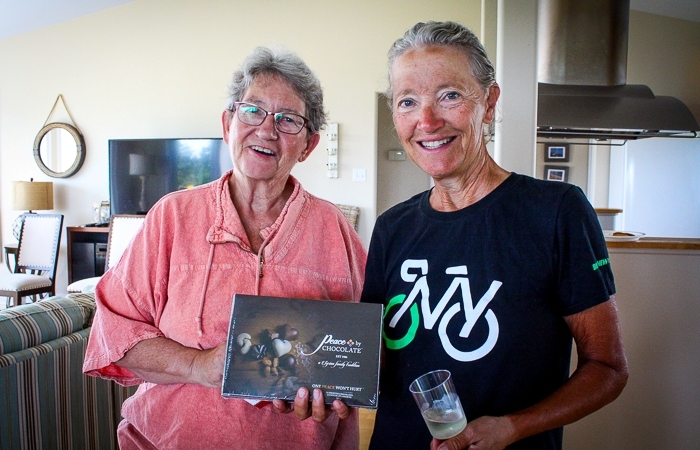 The delicious gift was as a result of the well-publicized success story readers may be aware of: the company was established by Syrian refugees who have re-established their family chocolate making business in nearby Antigonish. We reveled in some of the many dividends of peace: the Syrian family shared their new peaceful existence through Canada’s compassionate international actions, and their chocolates showed peace can also be enjoyed through shared taste savoring!